Arctic and Antarctic Sea Ice: How Are They Different? We often get questions from readers about Earth’s sea ice in the Arctic and the Antarctic, and the differences between those areas. Arctic sea ice has declined over the past five decades, while Antarctic sea ice has increased, and then declined. Why do they behave differently? The primary difference between the Arctic and Antarctica is geographical. The Arctic is an ocean, covered by a thin layer of perennial sea ice and surrounded by land. ("Perennial" refers to the oldest and thickest sea ice.) Antarctica, on the other hand, is a continent, covered by a very thick ice cap and surrounded by a rim of sea ice and the Southern Ocean. The Arctic Ocean is very deep and closely linked with the climate systems around it, making it more sensitive to climate changes than Antarctica. During the centuries of human exploration in the Arctic, sea ice covered the Arctic Ocean well year-round, up until recent decades. But satellite observations show that Arctic sea ice has been declining in extent*, thickness and volume since 1979.1 Average Arctic sea ice extent is at its lowest since 1850. During the summer melt season, the sea ice’s edge retreats toward the North Pole, only to re-grow during the Arctic winter. As a result of ongoing warming driven by human activities, the trend toward summer sea ice loss (from July to September, followed by a winter re-growth) continues. Recent research suggests that there is a relationship between Arctic sea ice losses and the human burning of fossil fuels in all months.2 Aerosols (tiny particles suspended in the atmosphere) tied to human activities have offset some of the Arctic sea ice extent loss trend; a reduction in aerosol pollution will likely see a sea ice loss acceleration.3 Ice loss at the sea ice’s margins** results in winds driving warmer water beneath the Arctic sea ice, increasing the amount of heat the Arctic Ocean stores 4 and priming conditions for further sea ice loss. 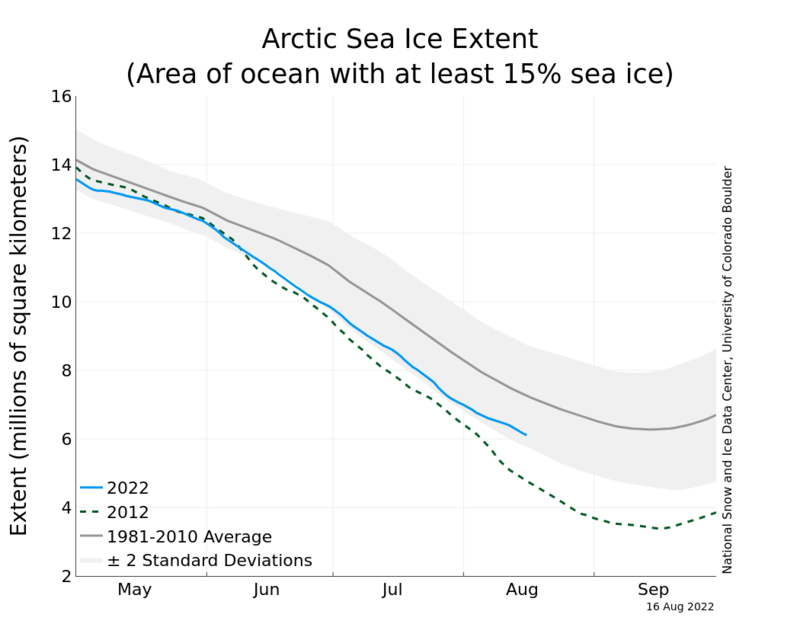 A figure showing current Arctic sea ice extent can be found here. Antarctic sea ice expands during the winter, only to melt back largely to the continent’s edge in summer. Antarctic sea ice extent is currently below the long-term average of all decades prior since 1979. Previously, Antarctic sea ice extent had been above that long-term average due to long-term, large-scale wind circulation patterns that drove sea ice away from Antarctica5, making room for more sea ice to form nearer to the continent.6 Climate models, or computer simulations that incorporate all the factors that affect Earth’s climate, predicted this behavior.7 These long-term wind patterns reversed several years ago, resulting in a significant sea ice decline surrounding Antarctica. 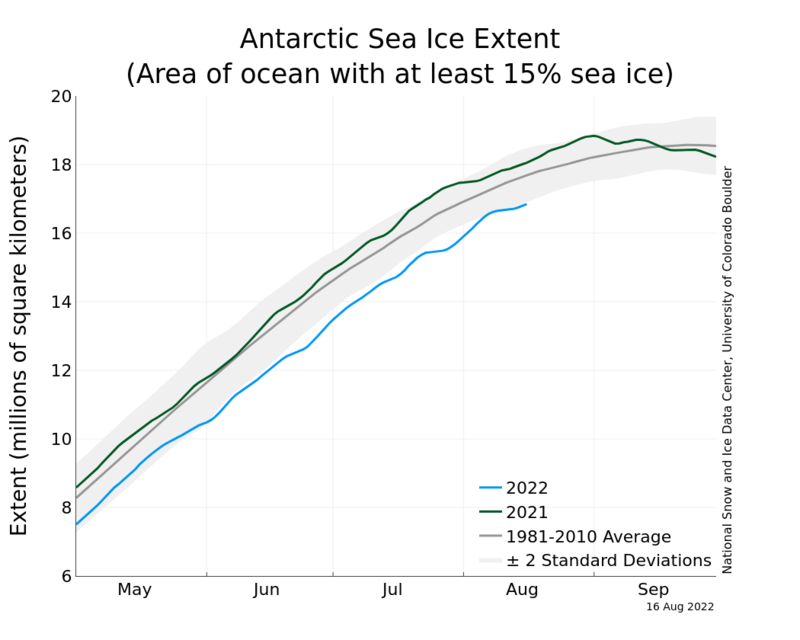 A figure showing current Antarctic sea ice extent can be found here. Some of the questions we receive ask why we should care about the polar regions. These regions are very important in regulating global temperature. Because sea ice has a bright surface, 50-70 percent of incoming energy is reflected back into space. As sea ice melts in the summer, it exposes the dark ocean surface. Instead of reflecting 50-70 percent of the sunlight, it absorbs 90 percent of the sunlight. As the ocean warms, global temperatures rise further. Also, what happens in the polar regions doesn’t stay in those regions. Their changes affect global temperatures and can even change ocean circulation. Earth’s sea ice is very attuned and responsive to even small changes in global surface and ocean temperatures. What’s the deal with Antarctica and the Arctic? *Sea ice extent is a measurement of the area of ocean where there is at least some sea ice. **Margins are transition regions between the ice-covered and ice-free portions of the ocean. On February 27, 2014, a Japanese rocket launched NASA’s latest satellite to advance how scientists study raindrops from space. The satellite, the Global Precipitation Measurement (GPM) Core Observatory, paints a picture of global precipitation every 30 minutes, with help from its other international satellite partners. It has provided innumerable insights into Earth’s precipitation patterns, severe storms, and the rain and snow particles within clouds. It has also helped farmers trying to increase crop yields, and aided researchers predicting the spread of fires. In honor of GPM’s fifth anniversary, we’re highlighting some of our favorite and most unique Earth Observatory stories, as made possible by measurements taken by GPM. In Fall 2018, storm after storm rolled through and dumped record rainfall in parts of Texas. When Hurricane Willa hit Texas around October 24, the ground was already soaked. One particularly potent cold front in mid-October dropped more than a foot of rain in areas. By the end of the month, October 2018 was the second wettest month in Texas on record. GPM measured the total amount of rainfall over the region from October 1 to October 31, 2018. The brightest areas reflect the highest rainfall amounts, with many places receiving 25 to 45 centimeters (10 to 17 inches) or more during this period. The satellite imagery can also be seen from natural-color satellite imagery. With the GPM mission’s global vantage point, we can more clearly see how weather systems form and connect with one another. In this visualization from October 11-22, 2017, note the long, narrow bands of moisture in the air, known as “atmospheric rivers.” These streams are fairly common in the Pacific Northwest and frequently bring much of the region’s heavy rains and snow in the fall and winter. But this atmospheric river was unusual for its length—extending roughly 8,000 kilometers (5,000 miles) from Japan to Washington. That’s about two to three times the typical length of an atmospheric river. Since atmospheric rivers often bring strong winds, they can force moisture up and over mountain ranges and drop a lot of precipitation in the process. In this case, more than four inches of rain fell on the western slopes of the Olympic Mountains and the Cascade Range, while areas to the east of the mountains (in the rain shadow) generally saw less than one inch. Knowing how much precipitation is falling or has fallen is useful for people around the world. Farmers, in particular, are interested in knowing precipitation amounts so they can prevent overwatering or underwatering their crops. The Sustainability, Satellites, Water, and Environment (SASWE) research group at the University of Washington has been working with the Pakistan Council of Research in Water Resources (PCRWR) to bring this kind of valuable information directly to the cell phones of farmers. A survey by the PCRWR found that farmers who used the text message alerts reported a 40 percent savings in water. Anecdotally, many farmers say their income has doubled because they got more crops by applying the correct amount of water. The map above shows the forecast for evapotranspiration for October 16-22, 2018. Evapotranspiration is an indication of the amount of water vapor being removed by sunlight and wind from the soil and from plant leaves. It is calculated from data on temperature, humidity, wind speed, and solar radiation, as well as a global numerical weather model that assimilates NASA satellite data. The team also looks at maps of precipitation, temperature and wind speed to help determine crop conditions. Precipitation data comes from GPM that is combined with ground-based measurements from the Pakistan Meteorological Department. Precipitation can drastically affect the spread of a fire. For instance, if a region has not received normal precipitation for weeks or months, the vegetation might be drier and more prone to catching fire. NASA researchers recently created a model that analyzes various weather factors that lead to the formation and spread of fires. The Global Fire Weather Database (GFWED) accounts for local winds, temperatures, and humidity, while also being the first fire prediction model to include satellite–based precipitation measurements. The animation above shows GFWED’s calculated fire danger around the world from 2015 to 2017. The model compiles and analyzes various data sets and produces a rating that indicates how likely and intense fire might become in a particular area. It is the same type of rating that many firefighting agencies use in their day–to–day operations. Historical data are available to understand the weather conditions under which fires have occurred in the past, and near–real–time data are available to gauge current fire danger. In this mountainous country of Nepal, 60 to 80 percent of the annual precipitation falls during the monsoon (roughly June to August). That’s also when roughly 90 percent of Nepal’s landslide fatalities occur. NASA researchers have designed an automated system to identify potential landslides that might otherwise go undetected and unreported. This information could significantly improve landslide inventories, leading to better risk management. The computer program works by scanning satellite imagery for signs that a landslide may have occurred recently, looking at topographical features such as hill slopes. The left and middle images above were acquired by the Landsat 8 satellite on September 15, 2013, and September 18, 2014—before and after the Jure landslide in Nepal on August 2, 2014. The image on the right shows that 2014 Landsat image processed with computer program. The red areas show most of the traits of a landslide, while yellow areas exhibit a few of the proxy traits. The program also uses data from GPM to help pin when each landslide occurred. The GPM core satellite measures rain and snow several times daily, allowing researchers to create maps of rain accumulation over 24-, 48-, and 72-hour periods for given areas of interest—a product they call Detecting Real-time Increased Precipitation, or DRIP. When a certain amount of rain has fallen in a region, an email can be sent to emergency responders and other interested parties. The GPM Core Observatory is a joint satellite project by NASA and the Japan Aerospace Exploration Agency. The satellite is part of the larger GPM mission, which consists of about a dozen international satellite partners to provide global observations of rain and snow. To learn more about GPM’s accomplishments over the past five years, visit https://pmm.nasa.gov/resources/featured-articles-archive. To learn more about the GPM mission, visit https://www.nasa.gov/mission_pages/GPM/main/index.html. This piece was originally published on the NASA Earth Observatory "Earth Matters" blog. Six trends to know about fire season in the western U.S. Lately, it feels like we’re hearing about wildfires erupting in the western United States more often. But how have wildfire occurrences changed over the decades? Researchers with the NASA-funded Rehabilitation Capability Convergence for Ecosystem Recovery (RECOVER) have analyzed more than 40,000 fires from Colorado to California between 1950 to 2017 to learn how wildfire frequency, size, location, and a few other traits have changed. 1. There are more fires. Over the past six decades, there has been a steady increase in the number of fires in the western U.S. In fact, the majority of western fires—61 percent—have occurred since 2000 (shown in the graph below). 2. And those fires are larger. Those fires are also burning more acres of land. The average annual amount of acres burned has been steadily increasing since 1950. The number of megafires—fires that burn more than 100,000 acres (156 square miles)—has increased in the past two decades. In fact, no documented megafires occurred before 1970. The recent increase in fire frequency and size is likely related to a few reasons, including the rise of global temperatures since the start of the new millennia. Seventeen of the 18 warmest years on record have occurred since 2001. 3. A small percentage of the West has burned. Even though fire frequency and size has increased, only a small percentage of western lands— 11 percent—has burned since 1950. In this map, wildfires are shown in orange. Private lands are shown in purple while public lands are clear (no color). The location of wildfires was random; that is, there was no bias toward fires affecting private or public land. 4. The same areas keep burning. How has only 11 percent of the west burned, yet the annual number of acres burned and the frequency of fire increased? It turns out that many fires are occurring in areas that have already experienced fires, known as burn-on-burn effects. About 3 percent—almost a third of the burned land—has seen repeated fire activity. The map here shows the locations of repeated fire activity. While you can’t see it at this map’s resolution, some areas have experienced as many as 11 fires since 1950. In those areas, fires occurred about every seven years, said Weber, which is about the amount of time it takes for an ecosystem to build up enough vegetation to burn again. 5. Recent fires are burning more coniferous forests than other types of landscape. Since 2000, wildfires have shifted from burning shrub-lands to burning conifers. The Southern Rocky Mountains Ponderosa Pine Woodland landscape has experienced the most acres burned—more than 3 million. 6. Wildfires are going to have a big impact on our future. Research suggests that global warming is predicted to increase the number of very large fires (more than 50,000 acres) in the western United States by the middle of the century (2041-2070). The map below shows the projected increase in the number of “very large fire weeks”—periods where conditions will be conducive to very large fires—by mid-century (2041-2070) compared to the recent past (1971-2000). The projections are based on scenarios where carbon dioxide emissions continue to increase. Source: NOAA Climate.gov map, based on data from Barbera et al, 2015. Smoke from wildfires is expected to impair outdoor recreational activities. Wildfires on rangelands are expected to disrupt the U.S.’s agricultural productivity, creating challenges to livestock health, declining crop yields and quality, and affecting sustainable food security and price stability. Unless otherwise stated in the article, these data come from NASA’s Rehabilitation Capability Convergence for Ecosystem Recovery. RECOVER is an online mapping tool that pulls together data on 26 different variables useful for fires managers, such as burn severity, land slope, vegetation, soil type, and historical wildfires. In the past, fire managers might need several days or weeks to assemble and present such a large amount of information. RECOVER does so in five minutes, with the help of sophisticated server technologies that gather data from a multitude of sources. Funded by NASA’s Applied Science Program, RECOVER provides these data on specific fires to help fire managers to start rehabilitation plans earlier and implement recovery efforts quickly. The researchers used the data layer showing historical fires since 1950, which were compiled from comprehensive databases by the U.S. Geological Survey Geospatial Multi-Agency Coordination, National Interagency Fire Center, Bureau of Land Management, U.S. Forest Service, and various state agencies such as the California Department of Forestry and Fire Protection. The historical fires do not include prescribed fires and undocumented fires. Learn more about the RECOVER program and its recent involvement with the Woosley Fire. The piece was originally published on the NASA Earth Observatory "Earth Matters" blog. My name is Mandy Bayha, and I am from a small community called Délįnę [pronounced De-lee-nay] in Canada’s Northwest Territories. With a population of about 500, the community is nestled on the shores of the southwest Keith arm of the beautiful Great Bear Lake. The Sahtúotįnę (which means “people of Great Bear Lake”) have been its only inhabitants since time immemorial. The community is rich in culture and language and has a deep sense of love and connection to the land, especially the lake. I am an environmental science and conservation biology student and the indigenous healing coordinator (an initiative called “Sahtúotįnę Nats’eju”) for the Délįnę Got’įnę government. Under the guidance and mentorship of the elders, knowledge holders, and my community's leadership, I have been tasked to facilitate and implement a pilot project that aims to bridge the gap between traditional knowledge and western knowledge to create a seamless and holistic approach to health and wellness. Traditional knowledge is relevant to everything we do, from healing, governance, and environmental management to early childhood development and education. Traditional knowledge encompasses virtually every human relationship and dynamic and outlines our relationships with each another, our Mother Earth, and our creator. As our elders say, “We are the land and the land is us. The land provides everything to us and is like a mother to us all and we all come from her.” We believe everything is interconnected and in a constant relationship, forever and always. I was able to participate in this incredible opportunity with a fellow Délįnę woman named Joanne Speakman, who is also an environmental science student. Our first day started on August 22, bright and early at 8 o’clock in the morning. We met the flight team at the Adlair Aviation hanger to undergo a safety briefing and egress training. It was like walking into a scene from the movie Armageddon. The two ex-U.S. Air Force test pilots were speaking a technical language riddled in codes, and the remote sensing engineers were spouting their checks and balances. I was thrilled to be surrounded by NASA employees all adorned in patches, jumpsuits, and ball caps. Afterward, Dr. Peter Griffith, the project lead, explained everything to Joanne and me in plain language. We then took a tour of the plane and learned how to exit in the unlikely event of an emergency. We were treated so nicely, and I felt more than welcome to participate. We were invited to sit in a jump seat situated right behind the pilots during take-off and landing. Joanne got take-off and I got landing. What an experience that was! During our four-hour flight, which took us from Yellowknife to Scotty Creek (a permafrost research site near Fort Simpson), Kakisa, Fort Providence, and back to Yellowknife, Dr. Griffith sat with us and explained the ABoVE project. He gave us background on how the “lines”—the strips of areas that were scanned by the radar—were chosen and filled us in on research done in those areas previously, such as major burn sites, permafrost melt, carbon cycling, and methane levels. He referred to pictures while explaining how certain equipment as well as ground data calibration and validation techniques were used. We also chatted with engineers from NASA’s Jet Propulsion Laboratory in Pasadena, California, who manned the remote sensing station on the flight. They explained that the remote sensing equipment, which was welded to the bottom of the Gulfstream III jet, is made of many tiny sensors that send signals to the ground that bounce back to a receiving antenna on the aircraft. The resulting data tell a story of what is happening on Earth’s surface, revealing features such as inundation (marshy areas where vegetation is saturated with water) and the rocky topography from the great Canadian shield, for example. The sensor they’re using is called an L-band synthetic aperture radar (SAR), which has a long wavelength ideal for penetrating the active layer in the soil. This is important for many reasons but mainly for indicating soil moisture. When flying above target areas, the pilots had to position the plane precisely on the designated lines to trigger the L-band SAR on the bottom of the plane, which would put the aircraft on autopilot mode and allow the sensor to “fly” the plane for the entire length of scanning the line. Once the scan was complete, the pilots would then take control of the plane again. The precision and accuracy for all those things to work in tandem was extraordinary to witness. After the last scan, I hopped into the jump seat directly behind the pilots and watched them land the plane. Once on the ground, we were greeted by reporters with Cabin Radio (a local NWT radio station) who interviewed us and took our pictures with the Gulfstream III jet in the background. It was an absolute honor and a once-in-a-lifetime experience that I will never forget. Fortunately, our incredible journey with NASA wasn’t yet complete. Joanne and I tagged along with two scientists, Paul Siqueira and Bruce Chapman, who are helping to build an Earth-orbiting satellite called the NASA-ISRO Synthetic Aperture Radar, or NISAR. We met up with Paul and Bruce early on the morning of August 24 and identified two lakes located just off the Ingraham Trail, a few kilometers outside of Yellowknife, to collect data that will help in the creation of algorithms to capture and interpret wetland and inundated sites via satellite and remote sensing. We reached the shores of the first lake and split into two groups, one scientist and one student per group. We walked in separate directions in areas of inundation between the open water and the treeline surrounding the lake and took measurements using an infrared laser for accurate distances between the treeline and open water and made estimations and diagrams to fully detail the ground view. We tackled the second lake with a canoe and could not have asked for better weather. We enjoyed our afternoon bathed in the sun. The waterfowl and minnows shared their home with us for a time. During our canoe ride, we learned a lot more about our scientist friends. They were part of a launch that carried some of the first remote sensing technology into space. This technology was then used to study the surface of Venus and Mars. How fortunate were Joanne and I to be able to listen and learn from such a brilliant crew of scientists who have had amazing careers. It was an enriching and humbling experience to participate in the ABoVE project. If an organization such as NASA realizes that indigenous traditional knowledge is both valid and important, then I am hopeful for our next generation of indigenous people. I believe that this is the first step in reconciliation: acknowledgment and appreciation. I would be honoured to participate again; however, I am more than grateful to know that there is this collaboration happening and that it includes the indigenous Dene of the north. This piece was adapted from NASA's Earth Expeditions blog. Overnight, I got to take part in a truly historic Operation IceBridge (OIB) mission, and I couldn’t be happier and more excited to tell you all about it! This mission, called Mid-Weddell, was probably the most complex not only of the fall 2018 Antarctic campaign, but all of IceBridge. To add to this, some unforeseen issues made this particular mission difficult. Upon landing after our previous mission, we were informed that there was a local fuel trucker strike. This meant NO FUEL for all of Punta Arenas, Chile. So, we had no fuel for our plane, which meant we couldn’t fly the next day and had no clue when this strike would be resolved. The strike was resolved after a few days, but the Mid-Weddell mission was again delayed when we found out that there were cracks in the NASA DC-8 pilot’s window. A new one had to be sent from Palmdale, California, and installed before we could fly again. There has to be a crossover of ICESat-2 in the middle of the night and in the middle of the Weddell Sea. In order to make things "easier" on ourselves (please note my sarcasm here), we were also “chasing the sea ice” during this flight. Why do we need to chase the sea ice, one might ask? Because sea ice (frozen floating sea water) is constantly in motion, being forced around by winds and ocean currents. This makes it rather difficult to fly over the same sea ice as ICESat-2 because the satellite can fly over our entire science flight line in about nine seconds, whereas it takes us multiple hours by plane. Thus, in order to fly over the same sea ice, the sea ice must be chased during flight. Chasing the sea ice is essentially my OIB baby project. Before this campaign, I diligently worked on writing code that would take in our latitudes and longitudes along our flight path, and, depending on the wind speed, wind direction and our altitude from the plane, determine where the sea ice that ICESat-2 flew over would have drifted by the time our plane got there. This way we could essentially fly over the same sea ice that the satellite flew over. To do this, we asked the pilots to take the plane down to 500 feet (yes, 500 FEET!) above the surface and stay there for roughly a minute in order to take wind measurements. Then I plugged these values into my code program and changed our flight path so we could fly over the same sea ice. We monitored the winds during our flight, and if they changed significantly, we would do this maneuver again. Now how cool is that? I was in charge of changing our flight path as we flew! Can’t say I’d ever “flown” a plane before. Since our flight was a low-light flight, it had to be conducted at night. So, we took off from Punta Arenas at 7pm for an 11-hour flight, heading south to the Weddell Sea. During our flight, and because of our flight path, we were able to see multiple sunsets and sunrises as the sun bobbed up and down across the horizon. Because of the low lighting, the sky changed from oranges to pinks to blues, making for quite the show from the DC-8’s windows. Even the land-ice lovers [on our flight] enjoyed it. Right before 1:35am local time, John Sonntag began a 10-second countdown. When zero was reached, ICESat-2 crossed directly above our plane, thus “playing tag with the satellite” and making history. It was the first time this was done since the satellite’s launch a little over a month ago. We all began chatting on our headsets about how awesome it was to be part of this mission and to be able to witness this moment. This is what OIB had been working toward since its beginning in 2009. The data gap was now successfully bridged between ICESat and ICESat-2. My name is Joanne Speakman, and I’m from the Northwest Territories (NT) in Canada. I’m indigenous to the Sahtu Region and grew up in Délįne, a beautiful town of about 500 on Great Bear Lake. Now I live in Yellowknife, NT, and study environmental sciences at the University of Alberta. I was a summer student this year with the Sahtu Secretariat Incorporated (SSI), an awesome organization in the NT that acts as a bridge between land corporations in the Sahtu. My supervisor, Cindy Gilday, helped organize a once-in-a-lifetime opportunity for me and a fellow student from Délįne, Mandy Bahya, to fly with NASA. It was a dream come true. One of NASA’s projects is called the Arctic-Boreal Vulnerability Experiment (ABoVE), which is studying climate change in the northern parts of the world. People from the circumpolar regions have seen firsthand how drastically the environment has changed in such a short period of time, especially those of us who still spend time out on the land. Weather has become more unpredictable and ice has been melting sooner, making it more difficult to fish in the spring. Climate change has also contributed to the decline in caribou, crucial to Dene people in the north, both spiritually and for sustenance. Studies like ABoVE can help explain why and how these changes are happening. Along with traditional knowledge gained from northern communities, information collected by ABoVE can go a long way in helping to protect the environment for our people and future generations. It was exciting to meet the ABoVE project manager, Peter Griffith, and the flight crew because it’s amazing what they do, and to fly with them was an incredible opportunity to learn from one another. Although we were from different parts of the world, at the end of the day we are all people who care about taking care of the environment. We flew on a Gulfstream III jet to survey the land using remote sensing technology. We flew from Yellowknife to Kakisa, Fort Providence, Fort Simpson and then back to Yellowknife. During the flight, crew ran the remote sensing system and they explained to us how it works. It got complicated pretty quickly, but from what I understood, a remote sensor is attached to the bottom of the plane and sends radio waves to the ground and bounce back, providing information about the land below and how it is changing from year to year. From left: NASA pilot Terry Luallen, Mandy Bahya, NASA ABoVE Chief Support Scientist Peter Griffith, Joanne Speakman, NASA pilot Troy Asher. NASA’s also working on building a satellite called the NASA-ISRO Synthetic Aperture Radar, or NISAR, which will help study the effects of thawing permafrost. Two of the lead scientists working on NISAR are Paul Siqueira and Bruce Chapman. While they were in Yellowknife, Mandy and I got invited to join them for a day to help collect field data. We met with Paul and Bruce early in the morning and then drove out on the Ingraham Trail until we reached a small, marshy lake. We got out and walked along the lake’s edge, making measurements of the amount of marshy vegetation from the shore to the open water, an area that I learned is called inundation. We used our own estimations and also a cool device that uses a laser to tell you exactly how far away an object is. Paul and Bruce will use the information we collected that day to figure out the best way to map wetlands, which will help the ABoVE project study permafrost thaw and help with development of the NISAR satellite by comparing our results to satellite images of the area. In the afternoon, we surveyed a second lake, this time using a canoe. The sun came out and we saw ducks, a juvenile eagle, and many minnows swimming around. Nothing’s perfect, but this day was close to it and we learned a lot along the way. Meeting and spending time with the NASA team, especially Bruce, Paul, and Peter, was the highlight of the two days. They’re incredibly kind and thoughtful and took the time to share their knowledge with us. ABoVE is a 10-year program and I hope there will be many more opportunities for northern youth to participate in such an exciting, inspiring project. There is so much potential out there. Thanks again for an amazingly fun learning experience! This piece was originally published on the NASA Earth Expeditions blog. Alex Niebergall is a PhD student in Earth and Ocean Sciences at Duke University and worked aboard the R/V Sally Ride in the North Pacific in August and September. Before I joined the science crew aboard the R/V Sally Ride and set sail for the middle of the Pacific Ocean for my first ever research cruise, I can honestly say I did not know what to expect. Would it be an adventure? I hoped so. Would it be long hours in the lab? Undoubtedly. Would it be like stepping into National Talk-Like-A-Pirate-Day for an entire month? Maybe not. What I did know is that the research cruise meant 34 days on the open ocean doing what I love, and that was the only enticement I needed to sign up! For me, it has always been about the ocean. Don’t get me wrong, I love science. I know this because my time as a researcher has taken me to far more windowless labs in the basements of old science buildings than remote, dream-like field locations, and I have enjoyed every second of this work too! But even this windowless basement science ties back to Earth, the environment, and most importantly (in my eyes) the ocean. Throughout elementary and high school, I was drawn to science and math because they gave me new ways to look at the world around me. Suddenly, every baseball game was a math problem—the velocity of the pitch, the angle of impact, the parabolic motion of the ball as it headed into the outfield (why, no… I’ve never been very good at sports, how did you guess?). As an avid outdoorswoman, I've found science unlocking even more secrets. Physics and geology courses taught me about wave motion and erosion. Biology, ecology, genetics, and evolution classes allowed me to go to tide pooling and appreciate the radial symmetry of an ochre sea star while understanding its predatory role in the intertidal ecosystem. A firm grasp of chemistry allowed me to look at the ocean on a much smaller scale—a system of salinity gradients, dissolved nutrients, and pH balance. (Not to mention that chemistry makes cooking more interesting!) These subjects were interesting because I saw them every day around me, connected and continuously in flux, influencing each other in every way and giving me a new appreciation for all the activities and places I already loved. In truth, science has taken me to some of the coolest places I could possibly imagine. As an undergrad, I went to field sites in the depths of the Northern California wilderness that look so wild and untouched they could be the set for the next Jurassic Park movie. I’ve been to redwood forests studying ecosystem dynamics. Science training took me to the underwater kelp jungles of Monterey Bay, California, and offshore Oregon where I learned, among other things, that measuring baby sea stars (sometimes the size of my thumb nail) becomes infinitely more challenging in a surge that forces you 8 feet in either direction. I also learned that sea creatures (specifically sea otters and trigger fish) have the ability and the instinct to irreparably damage science equipment, but THAT is a story for another time! Research took me to the underwater paradise that is the coral reefs of Indonesia, where night diving with bioluminescent dinoflagellates meant that the water around me perfectly mirrored the stars that sparkled out of the darkness overhead. Now as a brand new graduate student in Earth and ocean science, I found myself living on a floating laboratory in the middle of the Pacific Ocean, with a view of the waves as far as the eye can see in a blue hue that is unlike anything I ever saw in my life. My group’s project aboard the ship was focused on quantifying how the plankton communities in the ocean influence carbon export by estimating the net community production at the ocean’s surface. We did this by measuring biological oxygen concentrations in the surface water and pairing these data with genetic analyses of the microbial community. These measurements allowed us to infer how much carbon was being taken up by biological processes and, thus, taken out of the atmosphere. With this project, those same subjects I learned to love in the tenth grade—chemistry, ecology, genetics, math—tied together (with the help and expertise of many, many other dedicated scientists) to give us a comprehensive view of what is happening in the ocean and how it affects our planet’s climate. To some, the idea of being a floating speck in the middle of the ocean may seem isolating (or at the very least, nausea-inducing). To me, it is the coolest place I’ve ever been. The view reminds me that I am a small part of something big, not just as a junior scientist in the immense scientific undertaking that is the EXPORTS project, but also as one small human in the middle of an enormous planet that we have the privilege to explore, admire, question, and hopefully understand. Today, I am a happy, and very lucky, scientist because I was on this wild adventure, working alongside some of the most inspirational and dedicated scientists I have ever met. But tomorrow? Tomorrow I am eagerly waiting to see where science will take me next. This piece was originally published on NASA's Earth Expeditions blog. NASA has been tracking Florence since it began moving toward the East Coast of the United States and continued to monitor the storm as it inched across the Carolinas and farther inland. The space agency is sparing no available resource in working to keep disaster responders and agencies such as FEMA and the National Guard informed with the latest information to assist in decisions on everything from evacuations to supply routes and recovery estimates. NASA’s Land, Atmosphere Near real-time Capability for EOS (Earth Observing System) (LANCE) provides data and imagery from Terra, Aqua, Aura, Suomi NPP, and GCOM-W1 satellites in less than three hours from satellite observation to meet the needs of the near real-time applications community. LANCE leverages existing satellite data processing systems in order to provide such products from select EOS instruments. These data meet the timely needs of applications such as numerical weather and climate prediction, forecasting and monitoring natural hazards, agriculture, air quality, and disaster relief. The Advanced Rapid Imaging and Analysis (ARIA) team at NASA’s Jet Propulsion Laboratory in Pasadena, California, created a flood extent map from Sentinel-1 synthetic aperture radar data acquired 12 hours after Hurricane Florence made landfall. The map, which was pushed to FEMA’s SFTP server (and is available to download), depicts areas of the Carolinas in light blue pixels that are likely flooded. Media reports provided anecdotal preliminary validation. This map was cross-validated with ARIA’s earlier flood proxy map. This flood proxy map should be used as guidance to identify areas that are likely flooded, and may be less reliable over urban and vegetated areas. To overcome that limitation, NASA’s Uninhabited Aerial Vehicle Synthetic Aperture Radar (UAVSAR) instrument aboard NASA’s C-20A aircraft is slated to fly over flooded areas to validate and improve these maps as well as provide near real-time imagery to assist local, state and federal partners. For example, barrier islands and the immediate coastlines have borne the brunt of the storm surge and wind damage, resulting in the destruction of property along the coastline. UAVSAR imagery will help to clarify areas that have been impacted. Rapid acquisition of UAVSAR imagery revealing damaged homes and infrastructure provides higher spatial resolution details to complement “damage proxy maps” and other change detection approaches applied from routinely collected imagery or special collections from international partners. The Day/Night Band sensor of the Visible Infrared Imaging Radiometer Suite (VIIRS) aboard the Suomi-National Polar-orbiting Partnership and Joint Polar Satellite System satellite platforms (both NOAA partnerships) provide global daily measurements of nocturnal visible and near-infrared light. The VIIRS Black Marble product suite detects light in a range of wavelengths from green to near-infrared, including city lights and lights from other activity. On September 14, 2018 North Carolina officials said the number of power outages due to Florence was more than half a million. The NASA Black Marble product suite has been used to assess disruptions in energy infrastructure and utility services following major disasters. The night-time imageries are useful for pre-event and post-event mapping and monitoring of power outages in cloud-free conditions. Aboard the Aqua satellite, the agency’s Atmospheric Infrared Sounder (AIRS), in conjunction with the Advanced Microwave Sounding Unit (AMSU), was able to capture three-dimensional images of the storm’s approach by sensing emitted microwave and infrared radiation. Warm colors in the infrared image (red, orange, yellow) show areas with little cloud cover, while cold colors (blue, purple) show areas covered by clouds at high, cold altitudes. The darker the color, the colder and higher the clouds and the stronger the thunderstorms. In partnership with the National Oceanic and Atmospheric Administration, these atmospheric observations are assimilated into operational prediction centers around the world to improve hurricane path prediction and other forecasts. Another powerful instrument aboard the Aqua satellite (the same instrument is also aboard Aqua’s “twin” satellite, Terra) is the Moderate Resolution Imaging Spectroradiometer (MODIS). Aqua and Terra work in tandem to image the entire globe once every one to two days, which allows MODIS to capture a sweeping picture of any number of Earth dynamics, including storms, through its 36 spectral bands, or groups of wavelengths. Here, a MODIS image of Florence is shown with a cross-section of the storm taken on the same day by NASA’s Cloudsat satellite. The CloudSat pass offers a unique view of Florence’s asymmetrical structure, the intense convection and rainfall churning inside the storm, and a complex vertical cloud structure that is not visible from above. The storm’s clouds reached an altitude of about 15 kilometers (9 miles) at their highest point—fairly high for a tropical cyclone. The darkest blues represent areas where clouds and raindrops reflected the strongest signal back to the satellite radar. These areas had the heaviest precipitation and the largest water droplets. The blue horizontal line across the data is the melting level; ice particles were present above it, raindrops below it. Global multi-angle imagery of the sunlit Earth is the specialty of the Multi-angle Imaging Spectroradiometer (MISR) aboard NASA’s Terra satellite. The instrument takes seven minutes to capture images from all nine of its cameras to observe the same location. MISR can reveal areas of high cloud cover associated with strong thunderstorms as well as spot powerful outer rain bands, which can sometimes spawn tornadoes. Managed by the Jet Propulsion Laboraty in Pasadena, California, and in coordination with NASA’s Goddard Space Flight Center in Greenbelt, Maryland, the polar-orbiting Soil Moisture Active Passive (SMAP) satellite plays a key role in forecasting flooding conditions. SMAP measures the amount of water in the top 5 centimeters (2 inches) of soil everywhere on Earth’s surface every 2 to 3 days. This permits changes of soil moisture around the world to be observed over time scales ranging from the life cycles of major storms to repeated measurements of changes over entire seasons. SMAP is also capable of estimating wind speeds over the ocean, as shown in the image above. Astronauts aboard the International Space Station (ISS) have been snapping images of Florence with handheld digital cameras throughout the storm’s progression. Once the storm has passed and cloud cover lessens, requests to document flooding and changes to the land surface will be sent to the crew as part of ongoing NASA ISS response to the International Disaster Charter activation for Hurricane Florence. Imagery of this type is then georeferenced by the Earth Science and Remote Sensing Unit at NASA’s Johnson Space Center in Houston. Also aboard the ISS is the Lightning Imaging Sensor (LIS), which detects the distribution and variability of total lightning day and night in order to improve severe weather forecasting and further scientific study on the relationship between lightning, clouds, and precipitation. Over a 12-hour period, LIS observed an average of more than 5 lightning flashes every 90 seconds in the vicinity of Hurricane Florence on September 14, 2018. This piece was originally published on NASA's Disaster Response blog. After years of intensive research on Greenland’s glaciers, Josh Willis is standing next to one for the first time in his life. Apusiaajik isn’t one of Greenland’s giants — in fact, its name means “little glacier.” But its marbled blue-and-white wall of ice is tall, long and, as Willis says, majestic. It’s also melting. From time to time there’s a loud cracking noise, and seconds later, a few refrigerator-sized chunks of ice drop into the ocean. You can’t help wondering when a larger chunk will fall, and how much icy water will hit you when it does. It’s natural for glaciers to lose ice this way, though disconcerting when you’re in the neighborhood. But Apusiaajik is like most of Greenland’s glaciers, it’s out of balance — melting faster than it can be replenished by winter snowfall. We’re visiting the little glacier on a down day for NASA’s Oceans Melting Greenland (OMG) campaign. It’s close to Kulusuk, a tiny village on Greenland’s east coast that happens to have an airport with a 4,000-foot-long gravel runway. That’s too short for a big jet to take off and land. But for OMG’s converted DC-3, the Kulusuk airport is perfectly located for the mission’s survey flights around southeastern Greenland, studying how ocean water is affecting glaciers like Apusiaajik. OMG is on its third annual campaign out of a planned five. The goal each year is to blanket Greenland’s continental shelf with probes measuring the seawater’s temperature and salinity. This year, the team has already dropped 89 out of 250 probes, starting at the southern tip of Greenland and working up the east coast. Soon it’ll be time to move north to the next base. Halfway through OMG’s expected lifespan, what have scientists learned, and what do they still hope to find out? “We’re beginning to see the signs of long-term changes on Greenland’s continental shelf — changes that take years to happen,” Willis says. “We’ve never seen that before.” Daily changes in water temperature come and go, but the OMG scientists are finding that glaciers react more strongly to slow changes in water temperature far below the ocean surface. Greenland’s continental shelf is shallow, averaging about 1,600 feet (500 meters) deep. But it’s gashed by troughs carved by ancient glaciers, which can be two times deeper than that. These troughs are natural conduits for deep water to get up on the shelf, but it’s not an easy passage. Sills and underwater mountains within the troughs impede the flow and create basins. Willis gestures at the ice-flecked channel flowing past Apusiaajik. “In a couple of weeks, all this water will be way downstream,” he says. “In the troughs and basins on the shelf, that’s not true. They’re almost like tide pools — the water comes in at high tide and stays there till the tide comes back. In those deep basins, instead of twice per day like the tide, it’s more like once per year and sometimes less. And when warm or cold water gets in, it stays for years.” There’s not always enough variation in the seawater from winter or summer for water to get into the basins each year; it may take a change in a large-scale ocean climate pattern, similar to an El Niño event in the Pacific Ocean, to trigger the change. For the last two years, the North Atlantic has been moving into a naturally cooler climate phase. Willis is eager to see when and how far the cooler water will move up the West Greenland coast, and how long it will last. Answering those questions will chip away at the big remaining goal of OMG: quantifying how much glacial ice melt will result from any given change in ocean temperature. If water comes onto the continental shelf that’s a degree Celsius warmer than now, how much will the melt rate increase? What about three degrees? “One of the advantages of watching a glacier change year after year after year is that you begin to get an idea of what’s driving the change. If it’s the ocean, I think we’ll be able to quantify that with two more years of OMG data,” Willis says. We get it—the climate is changing. So what can we do about it?